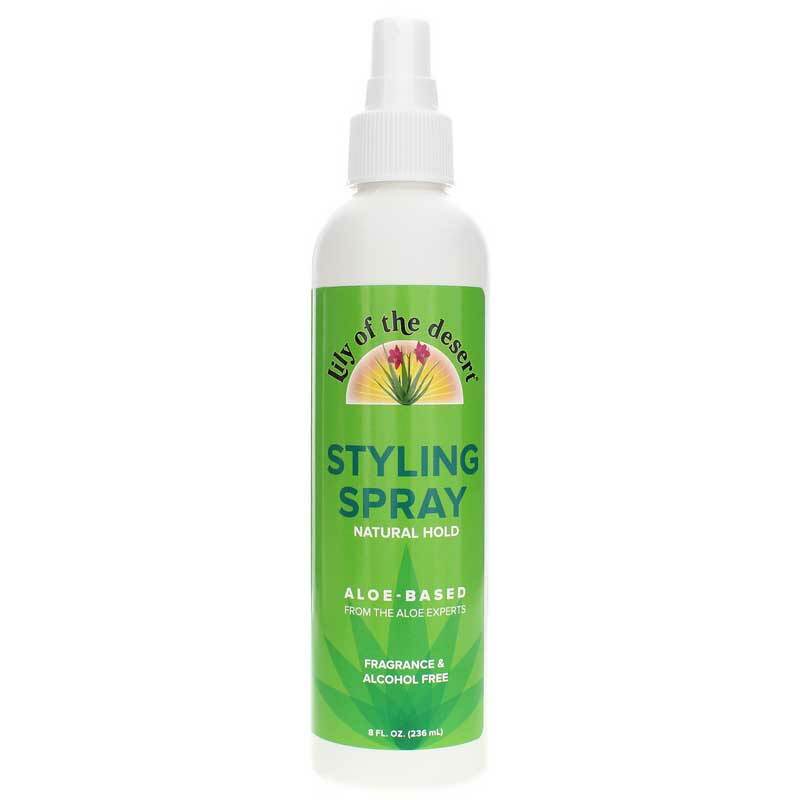 Aloe-Based Styling Spray Natural Hold from Lily Of The Desert is a fragrance-free hair care product that may support healthy looking hair and help maintain hold and texture during the day. 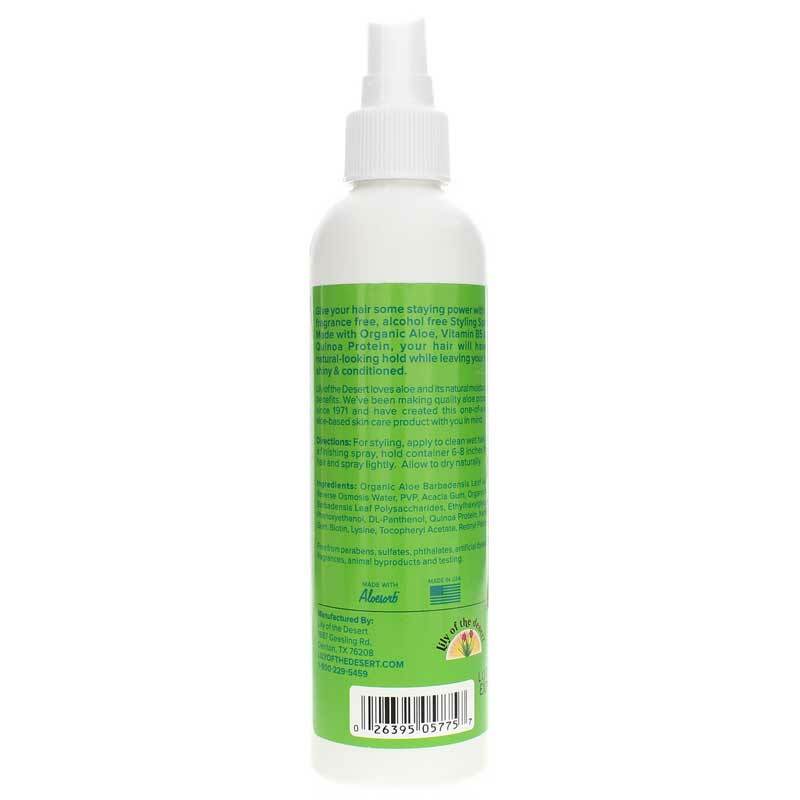 The main ingredient, organic aloe barbadensis leaf juice, makes this hair spray ideal for daily use and all hair types. When compared to competing products that use harsh chemicals, the formula in this hair spray is believed to work with the natural properties of hair and the scalp to bring out your inner beauty. There are more than 200 varieties of the aloe plant. The barbadensis variety contains an optimal mineralogical quantity when compared to some other aloe plants, which makes it ideal for support of healthy looking hair and scalp hydration. This formula also contains quinoa protein and vitamin B5 that supports a healthy looking scalp and support for the cellular development of skin, including skin flora and synthesis of vitamins and minerals inside the cells that make up the skin. If your old styling sprays are leaving your hair feeling course, then you should experience this aloe-based styling hair spray! Organic aloe barbadensis leaf juice, deionized water, acacia gum, organic aloe barbadensis leaf polysaccharides, ethylhexylglycerin, phenoxyethanol, DL-panthenol, quinoa protein, xanthan gum, biotin, lysine, tocopheryl acetate, retinyl palmitate. For styling, apply to clean, wet hair. As a finishing spray, hold container 6-8 inches from hair and spray lightly. Allow to dry naturally. Just what I my hair needed! I used to use aloe Vera gel on my hair when it was wet, and a natural hair spray after I styled it. This Aloe-Based Styling Spray works even better for both. When I put it in my wet hair, it helps prevent friz from blow-drying. It's hold as a hairspray is strong, but feels natural. As a hairspray, be sure to hold it at least 6 inches away, and don't over-spray. It is just what I have been looking for!